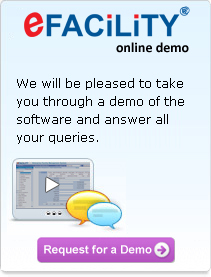 eFACiLiTY® You can use our Enquiry Form to communicate with us for more information on eFACiLiTY® and the related services. We will get back to you with the desired information at the earliest. We take your privacy very seriously, so you can be assured we will never pass your details to anybody else or use them for any other purpose.